Hydrochloric acid was discovered by the alchemist Jabir ibn Hayyan around the year 800 AD. It was historically called acidum salis and spirits of salt because it was produced from rock salt and “green vitriol” (Iron(II) sulfate) (by Basilius Valentinus in the 15th century) and later from the chemically similar common salt and sulfuric acid (by Johann Rudolph Glauber in the 17th century). Free hydrochloric acid was first formally described in the 16th century by Libavius. Later, it was used by chemists such as Glauber, Priestley, and Davy in their scientific research. Unless pressurized or cooled, hydrochloric acid will turn into a gas if there is around 60% or less of water. Hydrochloric acid is also known as hydronium chloride, in contrast to its anhydrous parent known as hydrogen chloride, or dry HCl. The old (pre-systematic) name muriatic acid has the same origin (muriatic means “pertaining to brine or salt”, hence muriate means hydrochloride), and this name is still sometimes used. The name hydrochloric acid was coined by the French chemist Joseph Louis Gay-Lussac in 1814. As a strong acid, hydrogen chloride has a large Ka. Theoretical attempts to assign the pKa of hydrogen chloride have been made, with the most recent estimate being −5.9. However, it is important to distinguish between hydrogen chloride gas and hydrochloric acid. Due to the leveling effect, except when highly concentrated and behavior deviates from ideality, hydrochloric acid (aqueous HCl) is only as acidic as the strongest proton donor available in water, the aquated proton (popularly known as “hydronium ion”). When chloride salts such as NaCl are added to aqueous HCl, they have only a minor effect on pH, indicating that Cl− is a very weak conjugate base and that HCl is fully dissociated in aqueous solution. Dilute solutions of HCl have a pH close to that predicted by assuming full dissociation into hydrated H+ and Cl−. Hydrochloric acid is the preferred acid in titration for determining the amount of bases. Strong acid titrants give more precise results due to a more distinct endpoint. Azeotropic, or “constant-boiling”, hydrochloric acid (roughly 20.2%) can be used as a primary standard in quantitative analysis, although its exact concentration depends on the atmospheric pressure when it is prepared. Hydrochloric acid is frequently used in chemical analysis to prepare (“digest”) samples for analysis. Concentrated hydrochloric acid dissolves many metals and forms oxidized metal chlorides and hydrogen gas. It also reacts with basic compounds such as calcium carbonate or copper(II) oxide, forming the dissolved chlorides that can be analyzed. Hydrochloric acid is produced in solutions up to 38% HCl (concentrated grade). Higher concentrations up to just over 40% are chemically possible, but the evaporation rate is then so high that storage and handling require extra precautions, such as pressurization and cooling. Bulk industrial-grade is therefore 30% to 35%, optimized to balance transport efficiency and product loss through evaporation. In the United States, solutions of between 20% and 32% are sold as muriatic acid. Solutions for household purposes in the US, mostly cleaning, are typically 10% to 12%, with strong recommendations to dilute before use. In the United Kingdom, where it is sold as “Spirits of Salt” for domestic cleaning, the potency is the same as the US industrial grade. In other countries, such as Italy, hydrochloric acid for domestic or industrial cleaning is sold as “Acido Muriatico”, and its concentration ranges from 5% to 32%. ^ a b “Hydrochloric Acid”. Archived from the original on 15 October 2010. Retrieved 16 September 2010. ^ “spirits of salt”. Retrieved 29 May 2012. ^ a b Trummal, Aleksander; Lipping, Lauri; Kaljurand, Ivari; Koppel, Ilmar A.; Leito, Ivo (2016-05-06). “Acidity of Strong Acids in Water and Dimethyl Sulfoxide”. The Journal of Physical Chemistry A. 120 (20): 3663–3669. doi:10.1021/acs.jpca.6b02253. ISSN 1089-5639. PMID 27115918. 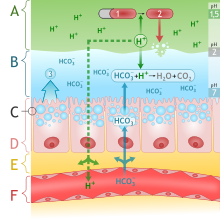 ^ “Human Metabolome Database: Showing metabocard for Hydrochloric acid (HMDB0002306)”. www.hmdb.ca. Retrieved 2017-11-04. ^ a b Pubchem. “hydrochloric acid”. pubchem.ncbi.nlm.nih.gov. Retrieved 2017-11-04. ^ “Muriatic Acid” (PDF). PPG Industries. 2005. Retrieved 10 September 2010. ^ Karpenko, V.; Norris, J.A. (2001). “Vitriol in the history of chemistry” (PDF). Chem. Listy. 96: 997. ^ a b c d e f g h i j k l m “Hydrochloric Acid”. Chemicals Economics Handbook. SRI International. 2001. pp. 733.4000A–733.3003F. ^ Norton, S. (2008). “A Brief History of Potable Gold”. Molecular Interventions. 8 (3): 120–3. doi:10.1124/mi.8.3.1. PMID 18693188. ^ Thompson, C. J. S. (2002). “Alchemy and Alchemists” (Reprint of the edition published by George G. Harrap and Co., London, 1932 ed.). Dover Publications, Inc., Mineola, NY: 61, 18. ^ Priestley, Joseph (1772). “Observations on different kinds of air [i.e., gases]”. Philosophical Transactions of the Royal Society of London. 62: 147–264 (234–244). doi:10.1098/rstl.1772.0021. ^ “List of precursors and chemicals frequently used in the illicit manufacture of narcotic drugs and psychotropic substances under international control” (PDF) (Annex to Form D (“Red List”)) (Eleventh ed.). International Narcotics Control Board. January 2007. Archived from the original (PDF) on 2008-02-27. ^ a b c d Perry, R.; Green D.; Maloney J. (1984). Perry’s Chemical Engineers’ Handbook (6th ed.). McGraw-Hill Book Company. ISBN 978-0-07-049479-4. ^ Agmon, Noam (January 1998). “Structure of Concentrated HCl Solutions”. The Journal of Physical Chemistry A. 102 (1): 192–199. CiteSeerX 10.1.1.78.3695. doi:10.1021/jp970836x. ISSN 1089-5639. ^ McCarty, Christopher G.; Vitz, Ed (May 2006). “pH Paradoxes: Demonstrating That It Is Not True That pH ≡ −log[H+]”. Journal of Chemical Education. 83 (5): 752. doi:10.1021/ed083p752. ISSN 0021-9584. ^ Mendham, J.; Denney, R. C.; Barnes, J. D.; Thomas, M. J. K.; Denney, R. C.; Thomas, M. J. K. (2000). Vogel’s Quantitative Chemical Analysis (6th ed.). New York: Prentice Hall. ISBN 978-0-582-22628-9. ^ “Systemnummer 6 Chlor”. Gmelins Handbuch der Anorganischen Chemie. Chemie Berlin. 1927. ^ “Systemnummer 6 Chlor, Ergänzungsband Teil B – Lieferung 1”. Gmelins Handbuch der Anorganischen Chemie. Chemie Weinheim. 1968. ^ Simhon, Rachel (13 September 2003). “Household plc: really filthy bathroom”. The Daily Telegraph. London. Retrieved 31 March 2010. ^ Haas, Elson. “Digestive Aids: Hydrochloric acid”. healthy.net. ^ Bowen, R. (18 March 2003). “Control and Physiologic Effects of Secretin”. Colorado State University. Retrieved 16 March 2009. ^ “Council Directive 67/548/EEC of 27 June 1967 on the approximation of laws, regulations and administrative provisions relating to the classification, packaging and labelling of dangerous substances”. EUR-lex. Retrieved 2 September 2008. ^ “HCl score card”. United States Environmental Protection Agency. Retrieved 12 September 2007.